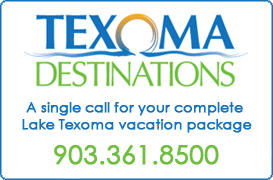 Considering a Lake Texoma vacation? Below you'll find a complete list of Lake Texoma waterfront vacation rental homes, cabins, bed and breakfast inns and lodging. Any Lake Texoma vacation rental owner may post their property on this site. Please contact the owner directly to discuss the details of their Lake Texoma vacation rental. 1/2 mile from 3 LAKEpoints! Sleeps 18+! 4 bed 3 bath on 1/3 acre!